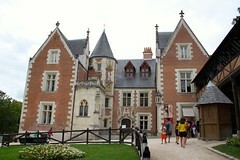 Leonardo da Vinci spent his final three years in Amboise in a chateau now housing a museum with models of his designs. Château du Clos Lucé is a relatively small 15th-century palace in the Loire town Amboise. The chateau was the childhood home of King Francis I but much more famously the palace where Leonardo da Vinci spent his final three years as the guest of the king of France. 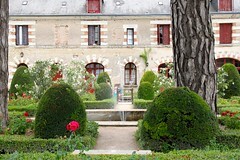 Clos Lucé is a museum on the life and work of Leonardo da Vinci. Apart from period furniture, many models of his designs are on display. A large landscaped garden is not only a pleasure to stroll in but has further models, art, and civil engineering works inspired by Leonardo da Vinci. Leonardo da Vinci accepted an invitation from French King Francois I (1494-1547, crowned 1515) to live and work in France. 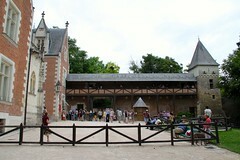 From 1516 to 1519, Da Vinci lived in Château du Cloux (now Clos Lucé) close to the royal castle of Amboise in the Loire Valley. In contrast to other “guests” of France, e.g. the King of Spain at Chateau de Valencay during the reign of Napoleon, Leonardo da Vinci came willingly to Clos Lucé were he was free to explore his interests and art. He received a generous pension free of any specific responsibilities. He frequently met with the young king, who could access Clos Lucé via a 400-m underground passage from the royal Chateau d’Amboise. Da Vinci possibly designed the double-helix staircase of Chateau de Chambord and completed major art works while in Amboise. Clos Lucé, a 15th-century chateau built on 12th-century foundations, now houses a museum dedicated mostly to the life and work of Leonardo da Vinci. Most of the art works are copies while the furniture date from the period but are not originally from the specific palace. Visitors enter the small chateau via a Renaissance gallery that gives lovely views of the garden and the pink brick and white tufa stone chateau. Note the Gothic elements on the façade including a statue of St Sebastian – the patron saint of archers – above the coat of arms of France. 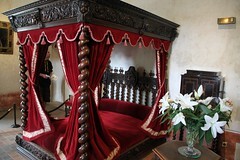 On the first floor of Château du Clos Lucé is the bedroom in which Leonardo da Vinci died on May 2, 1519. According to tradition King Francois I was at his side. Also on this floor is the bedroom of Marguerite de Navarre – the sister of Francois. The siblings spent much of their childhood in this chateau under the care of their mother Louise of Savoy. Back on the ground floor is a chapel with frescoes by Da Vinci’s pupils, an 18th-century salon, a Renaissance great hall and the kitchens. All are furnished with period items and tapestries. 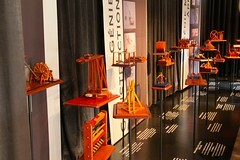 In the basement of the chateau are several working models of Leonardo da Vinci’s designs, which ranged from engines of war to civil engineering equipment. More small-scale models can be seen in a special exhibition room entered via Leonardo’s garden. Several further models can be enjoyed in the large landscape park at Clos Lucé, which is open during the warmer months only. In this park, around 20 further models and exhibitions explore the ideas of Leonardo da Vinci. Once again, several themes are covered to show just why Da Vinci was the ultimate Renaissance man, interested in everything around him. In a pond, a double-deck bridge shows his idea to improve traffic and hygiene in cities – commercial traffic on the lower level and high society on top. Da Vinci had an interest in designing military equipment and ideas modeled in the garden include a tank, machine gun and island of war. Children can try to lift water with an Archimedes screw, turn the helicopter and paddle wheel. 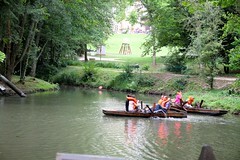 Paddleboats on the pond in summer give the most fun that can be had in this touristic region of France for €2. Several art works and ideas of Da Vinci are demonstrated in the park on large panels with a few audio descriptions. The dream of flight machine hangs in high trees. In the park is the Museographic Hall (extra charge) with an exhibition of Leonardo’s activities especially his life in France. It is worth the added expense, especially for family tickets where the surcharge is minimal. Chateau du Clos Lucé is open daily year round except on December 25 and January 1. Opening hours depend on the season. The chateau opens at 9 am (10 am in January) and closes at 18:00 from November to January; 20:00 in July and August; and 19:00 the rest of the year. The admission price for Clos Lucé is generally higher than for other larger chateaux in the Loire region. 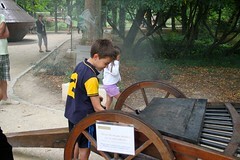 However, the displays are interesting and the park a pleasure to explore in fine weather. Families receive good discounts. The paddleboats in the pond are built to Leonardo da Vinci’s designs – expect to get a bit wet. The ten-minute or so paddle cost only €2 for a group of 4 / 5. The paddleboats operate in the afternoons in July and August and some vacation days and weekends in May. Tickets for Clos Lucé can be bought at the chateau or online but the mobile app is probably more useful than the online ticket offer. Up to three restaurants or tearooms are open in the park at Clos Lucé. Picnicking is also allowed in a dedicated area next to a large playground for smaller children. 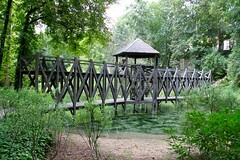 Château du Clos Lucé – Parc Leonardo da Vinci is at 2 rue du Clos Lucé – 37400 Amboise, around 400 m from the Chateau d’Amboise in the old town of Amboise to the south of Loire River. 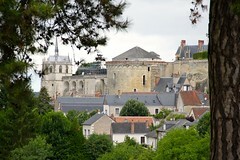 From the old town or Amboise castle, walk down Rue Victor Hugo. Amboise can easily be reached by car from other Loire towns and chateaux such as Chenonceau (20 min) or Chambord (an hour). Close Lucé has a small parking lot but any other parking area in Amboise town center is within walking distance. By train, Amboise can be reached from Paris in around 1h30 to 2h10. The direct intercity train from Paris Austerlitz takes around 1h40 and is the best value and easiest (but infrequent). Intercity trains via Orleans cost the same but take just over two hours. More frequent connections are available by taking a TGV (reservation compulsory) from Paris Montparnasse and changing to a TER train at Saint Pierre des Corps (near Tours). Traveling times should be around 1h30 but double the price of regular trains. The train station of Amboise (Gare SNCF) is on the north bank of the Loire River. The walk from the station to the old town – cross over the old Loire Bridge towards the Chateau d’Amboise – is just over a kilometer and around half a kilometer further to Clos Lucé. Buses also run from the station to the old town. An alternative is to take a day-trip bus tour from Paris to Amboise – Get Your Guide list several possibilities that include visits to Clos Lucé, usually in combination with Chenonceau and Chambord.